A training quotation is something that is unique in the business world. A training quotation is often asked by a company that is participating in a training program. For example, a tech company is training sales representatives on a new software or computer system. The training program is something very unique and only offered to a small niche of people that are representative of that niche. Another company that is sending sales representatives to the company would like a training proposal or a kind of training quotation. Included here on this page is a training quotation template to design a very high quality and professional quotation form. The training quotation templates that are provided to you, here are designed in Word and Excel. These are very popular software programs that are included on most computers. Consequently, it is easy to get started downloading and customizing the forms to fit your organization. Download the templates now. Open them up on your computer and take a look at the form. The template is easy to customize with your logo, address, telephone, website, serial numbers, notes, terms, and more. It is also easy to delete those sections that are not required or add another section to suit your purposes. 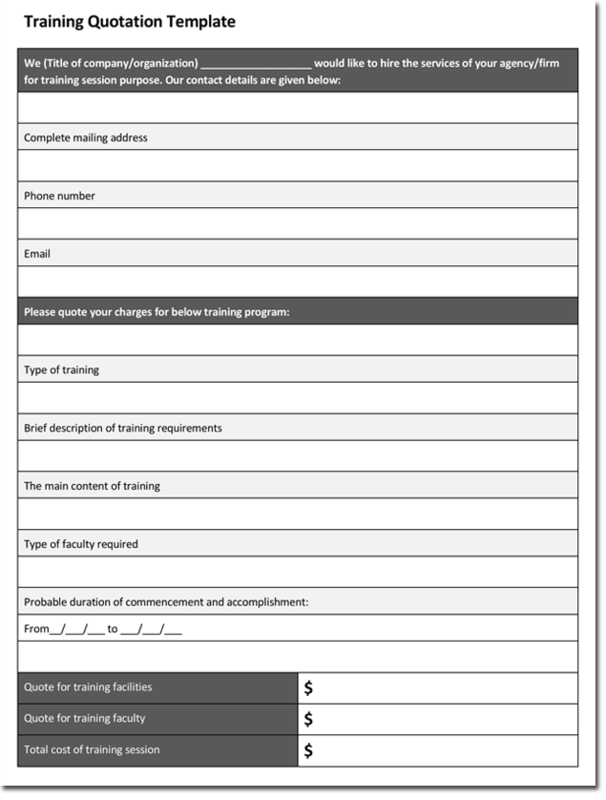 Editing and customizing the training service quotation form should only take a few minutes in most circumstances. Don’t forget to save the new customized template with a new name. Print out several copies to test for accuracy. The basic information on any general quotation form should make it easy for the reader to scan the form and understand the terms of the form. Of course, the company name should be at the header. Save time by adding the template information to business or company stationary. Try to include all important information in easy to read terms.